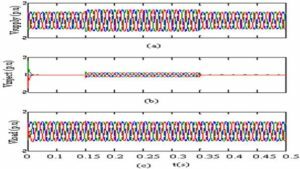 This project describes the problem of voltage sags and swells and its severe impact on non linear loads or sensitive loads. The dynamic voltage restorer (DVR) has become popular as a cost effective solution for the protection of sensitive loads from voltage sags and swells. The control of the compensation voltages in DVR based on dqo algorithm is discussed. It first analyzes the power circuit of a DVR system in order to come up with appropriate control limitations and control targets for the compensation voltage control. The proposed control scheme is simple to design. 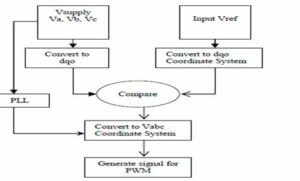 Simulation results carried out by Matlab/Simulink verify the performance of the proposed method . The modeling and simulation of a DVR using MATLAB/SIMULINK has been presented. A control system based on dqo technique which is a scaled error of the between source side of the DVR and its reference for sags/swell correction has been presented. The simulation shows that the DVR performance is satisfactory in mitigating voltage sags/swells. G. Hingorani, “Introducing Custom Power in IEEE Spectrum,” 32p, pp. 4l-48, 1995. IEEE Std. 1159 – 1995, “Recommended Practice for Monitoring Electric Power Quality”. Boonchiam and N. Mithulananthan, “Understanding of Dynamic Voltage Restorers through MATLAB Simulation,” Thammasat Int. J. Sc. Tech., Vol. 11, No. 3, July-Sept 2006. G. Nielsen, M. Newman, H. Nielsen,and F. Blaabjerg, “Control and testing of a dynamic voltage restorer (DVR) at medium voltage level,” IEEE Trans. Power Electron., vol. 19, no. 3,p.806, May 2004. Ghosh and G. Ledwich, “Power Quality Enhancement Using Custom Power Devices,” Kluwer Academic Publishers, 2002. 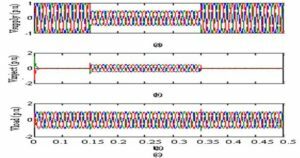 This entry was posted in Blog, scribd, slideshare, website and tagged DVR, Dynamic voltage restorer, matlab/simulink, Modeling and simulation, Modeling And Simulation For Voltage Sags/Swells Mitigation Using Dynamic Voltage Restorer (Dvr), voltage sags, voltage swells. Bookmark the permalink.